FILE - South Sudan's President Salva Kiir attends the 30th Ordinary Session of the Assembly of the Heads of State and the Government of the African Union in Addis Ababa, Ethiopia, Jan. 28, 2018. Ahead of a high-level forum on South Sudan next week, President Salva Kiir is urging SPLM ruling party officials to forgive his former deputy, Riek Machar, and said the rebel leader should return home. "You bring Riek Machar to Juba here. I guarantee his safety and I will protect him with the national army. If you don't believe me, the RPF [Regional Protection Force] is here. You bring the RPF to take charge of the security of Riek Machar in Juba. This is where we will be meeting him and so that we talk to him," Kiir told party members attending a National Liberation Council meeting late last week in Juba. The council is a legislative body of the SPLM. Kiir said he also wants all former detainees, including former SPLM Secretary General Pagan Amum, to return to Juba in accordance with a reunification agreement signed in 2015 in Arusha, Tanzania. "If you forgive those who are among you here, those of Taban [First Vice President Taban Deng Gai], and those of Ezekiel [Ezekiel Lul, minister of petroleum], those of John Luk [minister of roads and transport], why would you not forgive Riek? I still believe that Riek is a citizen of South Sudan. He will come," Kiir told party delegates. FILE - South Sudan rebel leader Riek Machar speaks in an interview with The Associated Press in Johannesburg, Oct. 20, 2016. Kiir said he believes insecurity across the country has prevented Machar and other opposition leaders from returning to South Sudan. He acknowledged that the issue has forced millions of South Sudanese to seek refuge in neighboring countries and in protection sites inside South Sudan. Kiir said it is time that he and other South Sudanese leaders swallow their pride and work together to change the direction of the country. "I want all of us to consider the plight of our people, then we change the way of doing things," Kiir told party members. Kiir's comments come as a top official within the SPLM-in Opposition, or SPLM-IO, faction led by Machar said his party is not focused on reunifying the SPLM, but on the talks May 17 in Addis Ababa, Ethiopia. At the forum, Imatong state governor-designate Oyet Nathaniel will head the SPLM-IO's Cluster for Governance, which is loyal to Machar. Nathaniel said his group was surprised to hear Kiir call for Machar's return. 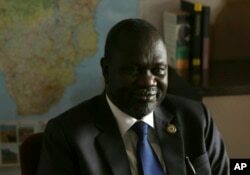 He told VOA's South Sudan in Focus program that Machar will only return after a comprehensive peace deal is signed with a clear agenda outlining the way forward. "We need a new transition, a new governance arrangement, new security arrangements to secure the transition. We need an overhaul in the security sector considering the fact that the fighting forces under Salva Kiir now are militias collected from Bar al-Ghazal, and parts of Upper Nile," Nathaniel told VOA. He said the SPLM-in Opposition no longer recognizes the 2015 reunification agreement. In a bid to try to prop up South Sudan's collapsing government, Gai said on Monday he had dissolved his faction of the SPLM-IO, saying it would boost the government's chances of restoring peace. 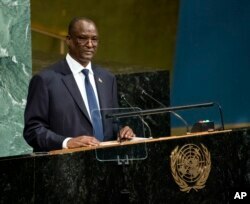 FILE - South Sudan's Vice President Taban Deng Gai addresses the United Nations General Assembly at U.N. headquarters, Sept. 23, 2017. "I would like to announce on behalf of the SPLM-IO structures and the entire membership of the party, the dissolution of the SPLM-IO organs and declare them to be united with the SPLM, the historic liberation party in the Republic of South Sudan," Gai said. Gai, popularly known as Taban Deng, said he was acting on a resolution the National Liberation Council passed last week that calls on all SPLM factions to reunite. Ruling party officials, former detainees, and the former SPLM-IO faction allied to Gai attended the meeting, but key signatories to the Arusha agreement such as Machar and former SPLM Secretary General Pagan Amum were not present. Gai has said a reunified SPLM will allow political leaders to address challenges facing the country and prepare for elections. "Reunification of SPLM will give more power, more spirit, and more energy to the party to strive on the areas of making peace," Gai said. Despite dissolving his faction, Gai said his group will continue to participate in talks in Addis Ababa under the government's delegation. "The Arusha agreement is very clear that the faction of the SPLM will continue leading an interim government until you have an election," Gai added. Kiir handpicked Gai to become the new first vice president and head the SPLM-IO after Machar fled Juba following renewed fighting between government forces and Machar's bodyguards in Juba in July 2016. South Sudan's conflict began in 2013 as a power struggle between Kiir and Machar.